Home » Posts Tagged "Day 3"
Day 3. 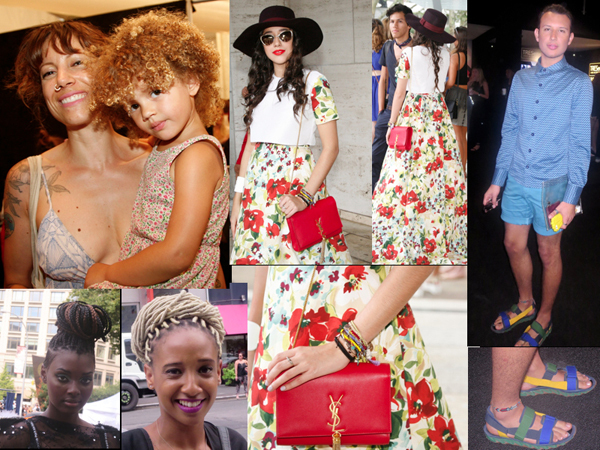 Fab Fashionistas Seen on Scene at Mercedes-Benz NY Fashion Week for Spring 2015. A hot day. Hot. In the 90s. Bottom Row Left to Right: Anais Simone with braided two-tone top knot wearing Marina Dobreva fashions … She was in a rush, so no name or info but interesting blonde wrap-around hair … Frances Estrada YSL bag with tassel, a wrist full of bracelets … Veneto Soberanes multi-colored sandals by Camper Together X Bernhard Willhelm.